Fibroids are very common benign, non-cancerous growths (tumour) of the muscle and fibre of the womb (uterus). They may cause no difficulty, but can cause problems with pain, bleeding and fertility. The location of the fibroid is more important than the size of the fibroid. For instance a 5cm fibroid growing out of the top of the uterus (the fundus) is much less likely to cause problems with bleeding or fertility when compared to a 2cm fibroid growing in the middle (subendometrial or submucous) of the womb. Alternately sub serous fibroids (on the outside surface of the womb) can be removed laparoscopically (Laparoscopy) or if multiple and large, by open myomectomy, or even hysterectomy (hysterectomy), if a woman’s family is complete and she does not want to have problems with new fibroids in the future. 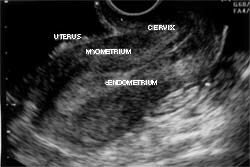 Above: Ultrasound image of a fibroid uterus.